Everybody wants to be a YouTubers these days, but not everyone has the cash for a big fancy DSLR. You already have to spend a ton of money on Tripods, Monopods, and Lighting Kits! Luckily, camcorders are still excellent, relatively inexpensive recording devices that have many advantages of their own. FilmToolKit has assembled this guide to help you find the best camcorder for YouTube to fit all your price ranges and personal preferences. 3 How Do We Determine The Best Camcorder For YouTube? Although they are rarely seen in the DSLR-dominated market, there are actually many reasons why buying a camcorder is worth it. Camcorders are generally much cheaper than DSLRs and Cinema Cameras. They’re Much more portable, as well as simpler and intuitive to use. They’re designed for video, and are way better for longer recording sessions. They won’t overheat. Some have features like internal storage, image stabilization, and Wi-Fi modes for streaming and remote control. They may feature built in ND filters for convenience in varying shooting situations. Camcorders are more ergonomic, and can be held comfortably for longer periods of time. The built-in microphones are of much higher quality better. A little over a decade ago camcorders were the standard recording device for creating home videos and capturing important memories. As you can see, there are still many advantages to using a camcorder for YouTube videos. Important note: This camera is the best of the best, aimed at video professionals and high-end consumers. If you don’t have a budget of nearly 1000$, scroll down to our next options. Here is a video quality test of the Canon Vixia HF G40. Incredible. Sure, the lighting and coloring were configured well, but the quality we’re seeing here is in a completely different class than almost every other camera on this list (except maybe #4). The advanced ultra-sensitive CMOS center gives you an excellent signal-to-noise ratio in 1080p 60fps. But if it only shoots 1080p and 60fps, you’re probably asking yourself, why is it so expensive? The camera is completely packed with small details that really take the quality to the next level. A larger-than-average aperture of 1.8~2.8, an OLED display, excellent low light performance and a proper lens hood and cap ensure that you’re recording your footage on a professional level. 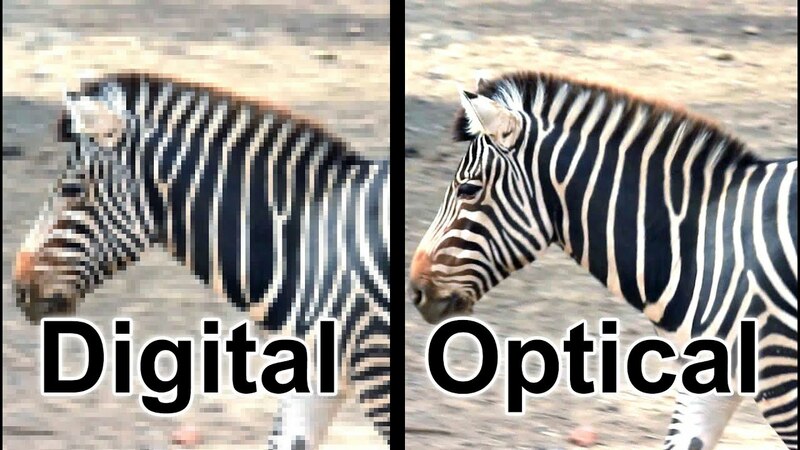 It even has features similar to the HDR modes on other cameras! Not to mention, there are many advantages to not shooting in 4k, such as greatly increased battery life and storage capacity. The size is a little on the heftier side in comparison to the cheaper camcorders, but we don’t think it is too heavy to warrant any complaints. Storage space is excellent with two SD card slots, and the battery life is long enough to keep you shooting all day without need for a recharge. The sound quality of the internal mic is excellent, and is just about the best you’re going to get from any camera on this list without having to buy an external boom microphone. As mentioned before, the OLED viewscreen is beautiful, bright, accurate, and the best of any camcorder on this list. The Wi-Fi technology implemented allows for remote smartphone control of your camcorder, as well as quick and easy transfer of your video files. With the Canon Vixia HF G40 you truly get what you pay for. This is a premium camcorder, and if you want the best quality possible for your videos without springing for an expensive DSLR, this is the best camcorder for YouTube on the market. Although the image quality can’t match that of the G40, the HC-V770 is capable of producing an image quality on par with many big YouTubers at about half the price. Recording full 1080p HD at 120 fps, this camcorder is loaded with tons of features that make it the best camcorder for YouTube in the $500 price range. The 4-drive lens system allows for a 20x optical zoom with no loss of quality, and a 50x digital zoom for those super far away details. Wi-Fi functions are all present, allowing you to control the camera through the Panasonic Image smartphone application and even broadcast your camera live on Ustream in full HD resolution. This is our favorite camera for streamers looking for a nice facecam. Like the previous camera, the low light performance is excellent due to the back side illumination sensor, which significantly reduces noise. Panasonic has a great 5-axis stabilization system to suppress blurring from motion and keep all of your shots looking pretty. Reviewers are very impressed with the audio performance. The microphone is as good as you’re going to get on any camcorder in this price range. and while there is only one SD card slot, you’ll likely never have problems with storage space because you’re not shooting in 4k. As mentioned before, you’ll have the ability to record all your footage at up to 120 fps in full HD and 240 fps at 720p. This means you can create beautiful slow mo shots to enhance the production value of your YouTube channel. What really makes the image quality shine is the HDR recording functionality. Scenes with a large amount of lighting contrast are captured in the best way possible using a process described at the bottom of this article. Bottom line is, this is truly a premium camera made for serious YouTubers. If you have a budget of around 500 bucks, this is going to be the best value for your money, and should last you several years with it’s quality output. Let’s be real, the last two cameras we suggested are quite expensive. While we recommend spending that much money if you’re going to be a career YouTuber, there are other options that get the job done well without breaking your bank. The Canon Vixia HF R70 is the best valued camcorder for YouTubers we could find. For around 200 dollars you are getting excellent video quality from one of the best brands on the market, and it’s packed with a ton of extra features. This is honestly the camera that the majority of you should be buying. Okay, the last two cameras are pretty tough to beat, but we think that footage is definitely serviceable, and won’t cause anyone to bat an eye. It’s better than most smartphones, and certainly a lot more stable. At less than 9 ounces, it’s insanely portable, and is still able to keep it’s stability with Canon’s SuperRange Optical Image Stabilization. This makes this camcorder perfect for Vlogging and other shooting situations where you are walking around. The Vixia HF R70 is capable of shooting 1080p at up to 60 fps, a framerate typically reserved for camcorders of a higher price tier, and allowing you to record smooth slow-mo shots. Wi-Fi and NFC connection features allow you to share your videos with the internet quickly and easily. You can even use it to live stream your camera feed to the internet! As we’ve said with the previous two recommendations, the microphone is the best you’re going to get for the price range. It’s not amazing, but it’s still a lot better than some DSLR’s we’ve encountered. If you’re going to be doing a lot of long range shooting, this camera has some of the farthest zoom features of any camera we looked at. It features up to 32x optical zoom with up to 57x Advanced zoom which is impressively clear. In terms of battery life and and storage capacity, this is also one of our favorites. You get 16GB of internal storage and an SD card slot where you can add up to another 128GB of memory so that you can shoot nonstop for an entire day without any worries. Many reviewers have praised the battery and claimed they never encountered issues where it wasn’t enough. At the bargain price of only $200, this is going to give you the most bang for your buck if you’re interested in becoming a YouTuber, but are not ready to take the full plunge just yet. Reviewers have been very impressed with it’s performance, and this is about the smallest amount of cash you can spend to get a worthwhile camera. Alright, maybe you’ve got big plans for your channel and you’ve decided that 1080p is simply not going to cut it. Whether you’re looking at doing some digital pans in post, or just want the highest resolution possible for your videos, 4k is a great idea, and out of all the 4k cameras we analyzed, it appears is the Sony FDR Ax53 is the best 4k camcorder for YouTube. As you can see, the image quality is absolutely beautiful. It’s incredibly detailed, and the depth of the focus will allow you to create really cinematic shots, something most other camcorder’s are incapable of. Recording 4k resolution at 30 or 24 fps, and up to 12o fps at 1080p, this camera will do just about anything you could possibly want it to do for a YouTube video. Time lapses are also possible in 4k resolution as well. Zooming features are, again, top tier, with up to 20x optical zoom and 30x digital zoom with very little quality decreases. Keep in mind, if you’re shooting in 4k, you’ll be able to do digital zooms while shooting, and in post, without losing too much quality in the end. The resolution enables you to reframe your shots or implement camera movement in post while still keeping your footage crisp and clean. The LCD is high contrast and beautiful. The form factor is sleek and lightweight, and don’t even get us started on the microphone. The premium 5-directional mic is astounding and pretty much guarantees you won’t need to spend any additional money to have serviceable audio in your videos. The real star of the show with this camera is Sony’s proprietary B.O.S.S image stabilization tech. Here’s a video showcasing the camcorder’s stabilization capabilities. Shaky videos will make people leave your channel without even giving you a chance, and this tech combined with a little bit of hand concentration will save you several hundred dollars on a proper camera stabilization device. And of course, like all of the camcorders that made our list, there are excellent WiFi and NFC features. Transferring movies and photos to your mobile device is a breeze, and you can stream everything you record directly to the internet via Wi-Fi from anywhere. If your budget is on the higher end, and 4K capabilities are of importance to you, then the Sony FDR AX53 is loaded with amazing features and is able to produce professional quality footage. It is certainly the best 4k camcorder for YouTube. Important Tip: With a price range as small as this one, your camcorder will be significantly outperformed by any modern smartphone. So, instead of buying this, just shoot your videos on your phone! If however, you don’t have a modern smartphone, these are both excellent choices for small budgets. Here is a video quality test of the Besteker HD 1080p Video Camcorder. Alright, it leaves something to be desired. If you are seriously looking into YouTube as your primary in this day and age, that quality is simply not going to cut it. However, if you just want to be able to shoot some video, and somehow are one of the dozen people in this world that doesn’t have access to some sort of smartphone camera, this is a great choice. At under 50 dollars the value is totally unbeatable. You’re getting 1080p footage with up to 10x digital zoom. (Did you really think you would get an optical zoom for less than 50 bucks?) It’s by far the most portable camcorder we reviewed, and the battery claims to last over 8 hours. Do make sure to purchase an SD card with this camera. There is no internal storage and it is not packaged with one. Tip: This is a great gift if you have any young children or grandparents that are interested in YouTube but have no means to record. Your 6 year old is too young to have a smartphone dude. How Do We Determine The Best Camcorder For YouTube? 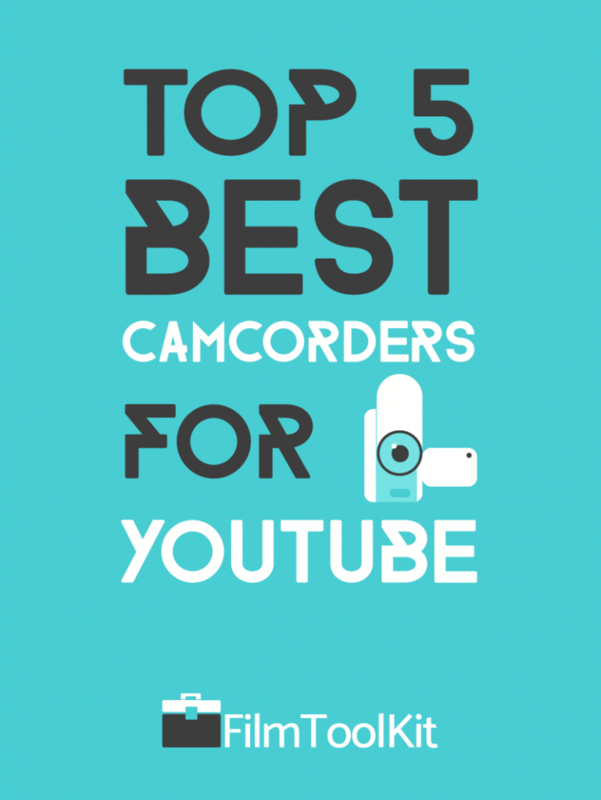 The following list describes the different factors we took into account when recommending the best camcorders for YouTube. These are important to consider, however, our rankings are ultimately determined by aggregating and analyzing user reviews. A camera might have the best fidelity in the world, but that won’t matter if it breaks down after a couple of weeks of shooting. Of course, with any recording device, the number one factor you should be considering is the image and audio quality produced. The quality you need may differ depending on your intended use conditions. If you’re looking to be a full time vlogger, you’ll want the best quality you can afford. If you just need something to record your facial expressions during a let’s play, a cheaper camcorder or a webcam may suffice. Audio quality may not be important to you either. While camcorders generally have better internal microphones than DSLRs, if you are a serious YouTuber you will likely have external audio recording solutions anyways. Ideally, you should purchase a YouTube camcorder that is capable of shooting 1080p at 24 frames per second. Resolution and frame rate are not the only factors however. Some cameras will have sensors that perform better in low light conditions, and others may have built-in ND features that will help fix overexposure problems. Sometimes the video codec can have a large impact on the quality as well. MP4 files are typically a sign of high quality camcorders. Consider your shooting environment when deciding what you are going to need. Again, depending on what types of environments you will be shooting in, portability may or may not be an important factor to you. Typically, the more features and fidelity a camcorder has, the bigger and heavier it is going to be. If your videos require you to trek through the wilderness for days at a time, you probably will want to go with a camera that’s on the lighter side. Keep in mind, heftier camcorders are beneficial in that they are more stable and will provide you with less shaky footage. Of course, this means they will be more strenuous to operate over long periods of time. Simple and easy to use zoom and focus control is one of the biggest advantages camcorders have over traditional DSLRs. Most of the cameras we recommended allow great control over these two variables. Some cheaper camcorders opt to forgo focus adjustment. Depending on what you are planning on shooting with your camera, this may or may not be a problem for you. However, nearly every camcorder will feature some sort of zoom dial. Think about whether or not this is important to you, as some camcorders will allow you to zoom much farther than others. Some cameras will feature true lens zooms, while others may only have digital zooms, or a combination of the two. Lens zooms are always better, but if the recording resolution is high enough, a digital zoom may be just fine. This is one of the biggest advantages of using a camcorder, but the extent of it will vary greatly from camera to camera. Some YouTube camcorders have a much longer battery life than others, and are intended for longer shooting situations like sports or other events. If you’re just going to be shooting from the comfort of your home, you may not need to spend more money on a camera that has an 8 hour battery life. Cameras can either feature internal storage, SD card slots, or a combination of the two. Our favorite cameras implemented a combination of the two, allowing you to always be able to shoot, but also expand your memory capacity as necessary. If you don’t own any SD cards and never intend to, obviously you will only need internal storage. If you have a ton of high-capacity SD cards ready to go, you should invest in a camcorder that has an external storage slot. This category is probably the biggest and has the most significant effect on the output of your camcorder. In this day and age, statistics like megapixels and resolution have lost their power. Anyone can buy a 1080p camcorder for under 50 bucks. It doesn’t necessarily mean it’s a good camera. We’ll list out some of the most impactful additional features here. Depending on your ability to hold a camera steady, or your access to additional stabilization equipment, built-in image stabilization may or may not be important to you. Regardless, it is almost always a direct upgrade to the quality of your footage, as shaky video can induce motion sickness and get people closing your videos really quickly. 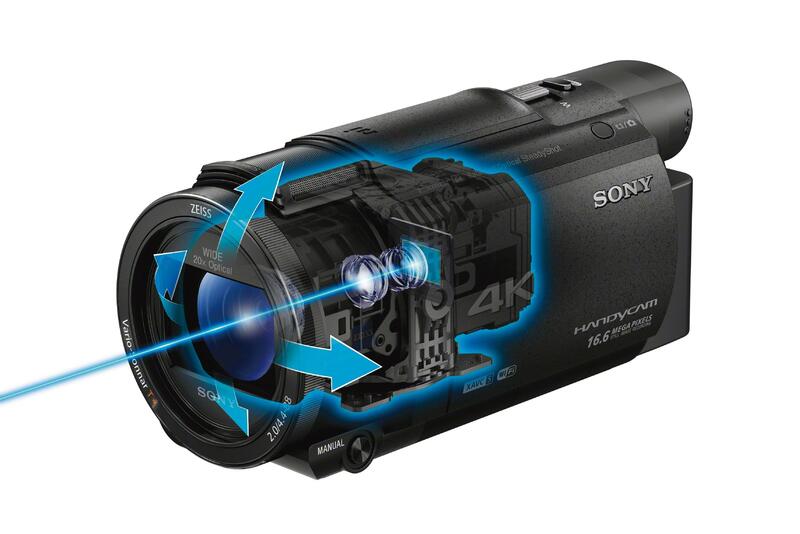 Sony’s Proprietary Balanced Optical Steadyshot stabilization technology. Different companies implement their image stabilization with different techniques, but the ones we recommended were all deemed by us to be very effective. Built in Wi-Fi technology is being implemented in more and more modern camcorders, and is quite a useful feature. Primarily this is used to instantly transfer footage to a mobile device or computer, or even stream your video footage across streaming services. This can also allow you to connect to a smartphone to control the camera or monitor the video feed. If any of these features sound important to you with your workflow, you may want to invest in a camera with these features. In recent years, smartphones, DSLRs and camcorders have begun to implement HDR features. But what does that even mean? This photo taken by my google pixel shows the difference. Notice how in the HDR image, both the over and underexposed parts are properly exposed. In High Dynamic Range photos and videos, the camera captures the images at several different exposures, then stitches them together to create more lifelike, beautiful footage. Some cameras have adjustable frame rate features that allow you to take interesting types of footage. Camcorders that allow you to decrease the frame rate allow for awesome time lapses, and increased frame rates gives you the ability to slow it down in post-production and create beautiful slow-mo shots. If you think you’re going to need this, make sure to get a camera that is capable. Typically camcorders will allow you to shoot more frames if you are willing to go lower in resolution. at least 60 FPS is recommended for proper smooth slow motion.